The Rev. David Weigum was born in Ludwigstal in the Province (Guberniya) of Ekaterinoslav on October 24, 1874, to Joseph W. Weigum and Christine Weidner. He died in Liestal, Switzerland on October 24, 1952. He was married in Oftringen in the Canton of Aargau, Switzerland on May 13, 1903 to Clara Pleuss, daughter of Samuel P. Pleuss and Marie Weber. She was born in Rothrist also in the Canton of Aargau on November 29, 1872 and died in Riehen in the Canton of Basel on December 31, 1965. 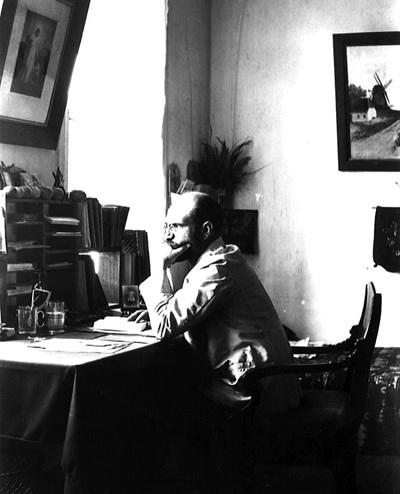 In 1894-97, 1899-1901, he was a student of theology in Basel. 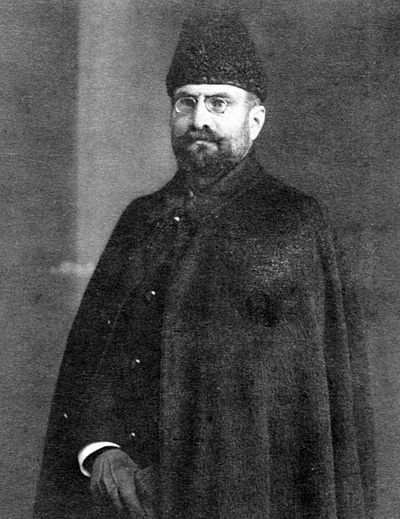 From 1903-05, he was pastor of the separatist congregation Neu-Hoffnung in Taurida (Russia). He was ordained in Neudorf in the Province of Cherson on July 2, 1906 and served there as pastor from 1906-1910. From 1910-1913, he served the parish of Norka. The Rev. David Weigum. Used with permission of AHSGR. Pastor David Weigum in his study. Used with permission of AHSGR. ​During the three years that Pastor David Weigum served Norka, Pastor Wilhelm Stärkel, who had been pastor in Norka from 1878-1908, was still alive and living in retirement in the Norka parsonage. The Weigum children, so Dr. Walter Weigum informs us, were fond of the old man: "he had himself become somewhat childish and was obviously a good playmate." 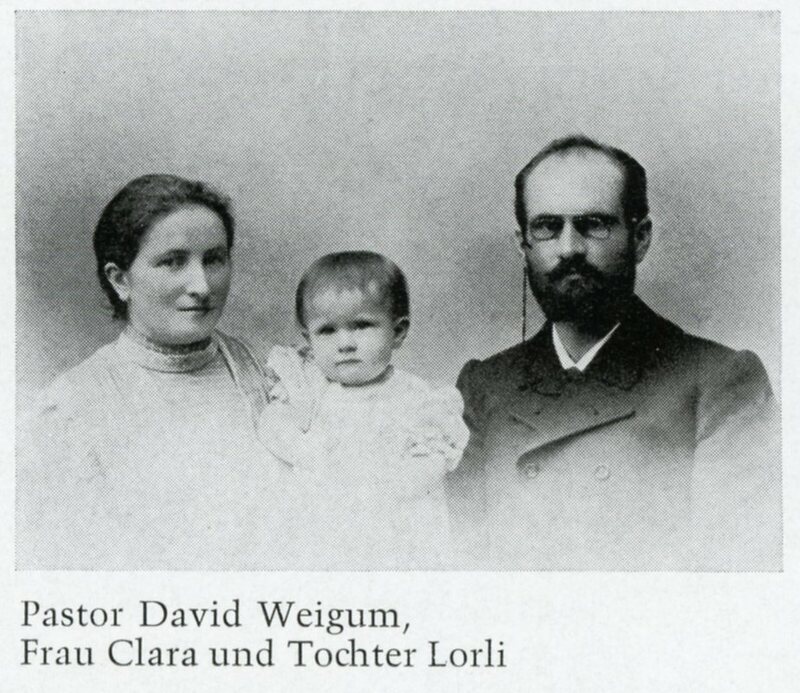 Photograph of the David and Clara Weigum family. 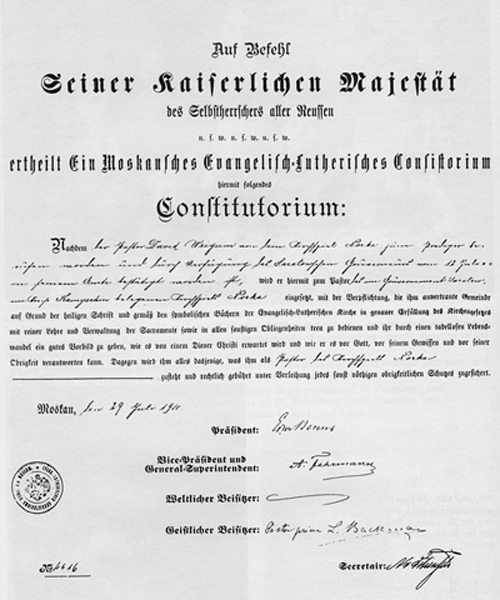 Source: "Die Kirchen Und Das Religiöse Leben Der Rußlanddeutschen". In 1913, Rev. Weigum moved to Appenzell, Switzerland, from where he served the Reformed diaspora congregation in Appenzell-Inner-Rhoden until his retirement in 1937. In retirement, he lived in Riehen, near Basel, Switzerland. He died in 1952. Weigum wrote a book titled "My Home on the Crimean Steppe". This book is a translation of his German manuscript, "Aus Heimat und Leben," edited by the author's son, Walter Weigum, who contributed the Introduction. The book is a look at everyday life in Ludwigstal, a German village in the Crimea, in the 1880's. The author later became a pastor in the Reformed Church and served in the Black Sea and Volga regions. Many of his relatives came to America during the years 1891 to 1912. The book includes maps, pictures, and a genealogical appendix. Amburger, Erik. Die Pastoren Der Evangelischen Kirchen Russlands Vom Ende Des 16. Jahrhunderts Bis 1937: Ein Biographisches Lexikon. Lüneburg: Inst. Nordostdt. Kulturwerk, 1998. 508. Print. Schnurr, Joseph. Die Kirchen Und Das Religiöse Leben Der Rußlanddeutschen. Stuttgart: AER-Verl., 1978: 179. Print.